A program is not like an event. A program is a set of services and organisations activities that generally take place over a relatively long period of time such as a season, a semester or a year. When the timeframe is shorter such as a day, a weekend or a week, the services and activities provided is likely to be called an event. Program budgeting is therefore the identification and calculation of revenues and costs associated with the delivery of services and activities over a significant period of time. 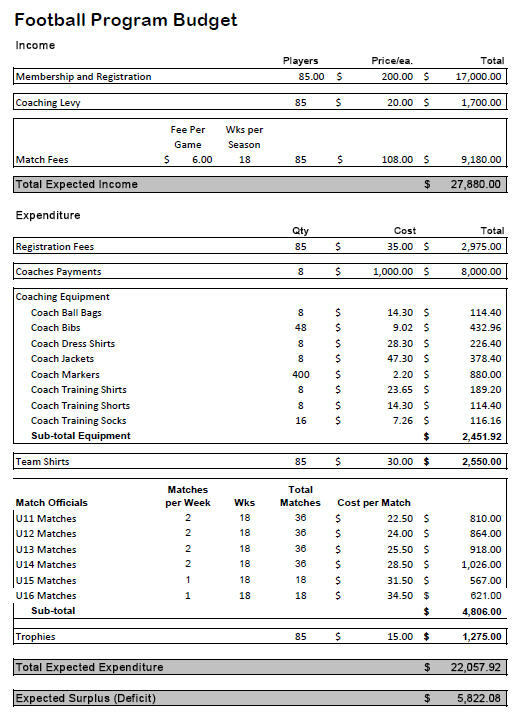 A good example of program budgeting in the context of a sport organisation occurs when calculations are made to find the probable revenues and costs associated with providing coaching, clothing, competition fixtures and pitches to all junior members of a football club for a season (i.e. the Junior Football program). Like any other budgeting activity, the first task is to identify all possible costs. Some costs will be easy to identify while others will be hidden. It is very useful to get others involved in identifying costs. There is always something likely to be missed and if this happens, it can have major ramifications on the program profitability. Once all costs have been identified and a total calculated for the program, the next task is to workout what to charge the program participants. It is not always possible to know exactly how many people will participate but a cautious estimate should be made. Cautious because it is always better to underestimate than over-estimate the number of participants. Profit - if the intention of the program is to make a profit, then the desired profit must be added to the total program cost. Contingencies - there will always be unknown costs e.g. price rises. It is a good practice to add a further 10% to the total of program costs to cover unknown costs. Another complication occurs when participants may be charged different fees e.g. a coaching levy, registration fees, match fees. This is likely to occur. This does not matter much provided the total of all fees reaches the required total. In such a situation it becomes necessary to develop a spreadsheet to predict what will happen according to the number of people who pay at each fee level, or each type of fee. The illustration below shows the expected income and expenditure for a Junior Football Program for age groups 11 -16 years. Costings for the program are comprehensive and include player registration fees, coaches payments, coaching equipment, referee costs and trophies. Once the total of all costs is calculated, then the method for fees and levies can be worked out and the profit calculated.